They call it a “prank” or a “hoax”, but it’s actually a fraudulent call to law enforcement with intent to have an innocent person or persons killed under color and claim of official right. On January 19, 2016, California Attorney General Kamala D. Harris and Placer County District Attorney R. Scott Owens, announced the arraignment of Riley Bangerter, 36, of Roseville. Bangerter has been charged with 11 counts of identity theft in a case of cyber harassment. Bangerter was arrested on December 3, 2015 and was arraigned on January 11, 2016. Bangerter has pled not guilty. In 2011, Attorney General Harris created the eCrime Unit within the California Department of Justice to identify and prosecute for crimes including identity theft, cybercrimes and other crimes involving the use of technology. An investigation by Attorney General Harris’ eCrime Unit found that Bangerter superimposed images of his ex-wife onto pornographic images and posted them online, accompanied by her personal identifying information. Excellent advice, and it encourages and inspires. “Starve them.” I’ve said the same thing. Thanks so much for this post. I’ve talked before about how I train in Brazilian Jiu Jitsu. Recently, I have started assisting with teaching the kid’s class. It is shocking how much time we devote to training kids to stand up to bullies. Bullies, in my opinion, are among the lowest known existing lifeforms. I wouldn’t want to insult cockroaches and fleas by drawing a comparison. I’d love to say that we leave bullies behind when we are no longer kids, but I think bullying just gets worse and harder to fight. 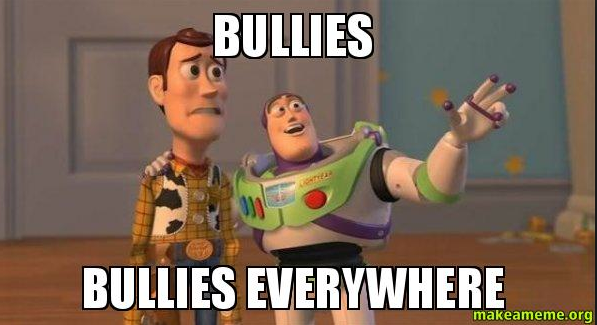 As writers, we deal with bullies a lot. Tragically, I’ve received many messages from semi-suicidal writers who left their dream profession because they had the misfortune of landing in the crosshairs of cyberbullies and no longer could endure the stress. I have a hard time blaming them. I know what it is like to be willing to do anything to escape the torment. In November 2014, we reported on the case of Steven and Joseph Rusinowski versus Robert DiDomenico. It was a case of cyberharassment gone wild. The case was originally filed in the Circuit Court of Cook County and on July 15, 2011, transferred to the federal district court for the Northern District of Illinois. On October 2, 2014, the jury returned a verdict in favor of Rusinowski and against DiDomenico, awarding Rusinowski $50,000. One of the most important rulings in that case caught the attention of attorneys. The judge ruled that Illinois has long arm jurisdiction that applies to electronic harassment. That means that those who harass citizens of Illinois over the internet and/or telephone, no matter where the perpetrator lives, will have to defend in Illinois. In February of this year, we reported on Brandon Wilson of Las Vegas, Nevada, who hacked, harassed, and pulled pranks over the internet. Evidently feeling comfortable behind his computer and using handles, he made a serious mistake — he made a call to Naperville, Illinois 911 and gave a false police report resulting in SWAT showing up to an innocent man’s house. Evidence was gathered from Wilson’s computers showing that it was not the only time that he made a false police report. Wilson was extradited to Illinois. The other week, I was watching the Steve Harvey show and Paula Todd was a guest on his program. Paula Todd is a Canadian journalist, investigative author, broadcaster, and lawyer. She is a professor of broadcast journalism and digital media at Seneca College, and is a frequent speaker on cyberabuse, Internet culture, writing, reporting, literacy and freedom of the press. In 2014, she published the book, Extreme Mean: Trolls, Bullies and Predators Online. For those who have Word Press blogs, you know that we can see referrals to our blog from other sites and emails. I don’t always check that section on the Admin side, but when I saw a significant increase in the number of views one day, I did check. Online, he uses the handle “Famed God.” Brandon Wilson now has fame, but not in the manner he wanted. Thursday, Wilson was arrested in Las Vegas, Nevada. He is now behind bars in Nevada waiting extradition to Illinois. In July, Wilson allegedly reported a murder to Naperville’s emergency 911 line. The SWAT team responded and found that the call was a false report. Illinois prosecutors said there is evidence on Wilson’s computers that the July 10, 2014 “swatting” hoax was not the only time that Wilson made false police reports. “Swatting” is the new form of internet harassment which involves falsely reporting a dangerous situation to send the police to another person’s home. The false report can lead to deployment of a SWAT team. Wilson is also said to have hacked the gaming consoles of two others and threatened to put someone “in debt for life” by accessing banking information. Illinois prosecutors said charges Wilson faces include two counts of computer tampering, one count of intimidation, computer fraud, identity theft and disorderly conduct. If convicted, Wilson faces up to 5 years in prison. Five words I would hear on a regular basis day in and day out when training as an amateur boxer; “Protect yourself at all times.” You hear those words time and time again in the gym, even while hitting heavy bags or doing mitt work. It’s important even during sparring although those sessions are controlled and not as intense as an actual fight. The idea is to instill that way of thinking into your head so you keep your hands up, keep your head moving and your feet moving, thus reducing the chance of getting caught with a shot you don’t see only to deposit you on the canvas. It’s the last set of words you hear after having passed the ammunition to your opponent (Touching Gloves) and just before the opening bell sounds. What do I mean in all of this? Lets look back when the internet started to surface and started to become the trend that it is today. If you were a parent back then or even a single lady living alone, the internet was a place where you knew trouble lurked. You didn’t want your kids on the internet because you have prowlers trying to lure your kids to meet them. You have scam artists setting up websites in attempt to look legit but are intended to get your personal info and steal your identity or clean out your bank account. These are things we are all aware of and we all keep our guard up in regards to these types of realities. But I am going to take it even one step further. How many of you have surfed Youtube only to see some crazy conspiracy theories in the videos? I am pretty sure everybody here has stumbled across them on a couple of occasions. The disturbing part is the creators of the videos; the creators of those theories, believe in them so much that if you even utter a word disagreeing they tend to claim your hired by the Government sent out to discredit truth seekers. Or am I the only one who happens to find Youtube users like that? Don’t take my word for it. Look up some of the Planet X theorist and try to debate reality with their warped sense of thinking and see what happens. There hasn’t been much of a change in Mr. Stalkers behavior since losing his bid for a restraining order and having one issued against him. But we expected that. I mean after all we are dealing with a mentally ill individual who in his own mind, seems to believe he is untouchable. Since the final order was entered, his harassment hasn’t stopped. In fact he has advanced his harassment to the point where there is currently an active investigation in the works for violations. So what has exactly happened since? Well in late August Mr. Stalker decided to ask the appellate court to re-instate his temporary restraining order that request was denied. Shortly after having been denied his request to re-instate the temporary restraining order, Mr. Stalker motioned the court to sanction me. The court denied his request. As expected, not satisfied with the outcome of both orders, Mr. Stalker decided to petition the court for a restraining order, filing a new case claiming he is being harassed once again, and stating its continued harassment post our June 2nd hearing.